Even though modern cabling standards accommodate the idea of being able to work as part of any type of network, it is beneficial for the future to keep in mind what kind of application in particular will be used. Identification of the network should begin from understanding its topology. Term “topology” refers to the physical layout of the network in the system. Different topologies require different equipment and cabling, and it can mean different levels of scaling and management. Main topologies at the moment of this article being written are star, bus, and ring. Often the mix of those topologies is used in the network, since each topology is beneficial for its own purpose. Star topology (sometimes Hierarchical Star topology) is using a central point to connect all of the devices. We would refer to the central point as hub. Hub can be a number of servers or switches located in the central equipment room. Or it could be a simple router box, that most of people have at home. In first scenario, numerous cables would run from the central equipment room to the outlets in the office building. In second – WiFi and cables running from router to home computers and connected to computers NICs. In any case it would be using star topology. Benefit of using the star topology network is that in case of cabling failure between an two devices in the network, all the other nodes would be unaffected. In case of single node failure in the network, none of the other nodes would be affected either. However if there is central node (hub) failure – the entire star would be inaccessible. Bus topology (sometimes Linear Bus topology) is the simplest of three topologies. all of the devices in the network are connected to the contiguous cable in the middle. Ethernet accommodates this topology, since every computer in the Ethernet determines when the network is not busy, and then transmits and receives data intended for it. Computers in bus network do not re-transmit signal but only listen for it. They will response only if signal is intended for them. Signal in the bus topology travels both directions until it reaches the end. In normal situation, when reaching the end signal would bounce and travel back and forth. In order to stop that from happening, both of the ends are equipped with the component called terminator. It absorbs signal, not letting it travel any further. 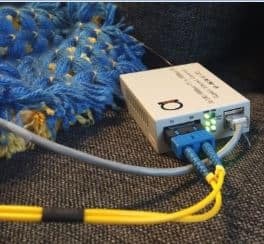 Drawback of the bus topology, is that it will fail completely if the cable is cut anywhere in the network or any of the terminators is removed. Ring topology is called like that because it is organised in the circle. Each device in the circle transmits data to the next one. It will not transmit any further if the signal is intended to it. That makes ring topology very vulnerable for the cuts, since single cable cut, or device failure can take out the whole network. Due to difficulty of adding new nodes to the network and configuring them, this type of network is not very scalable.